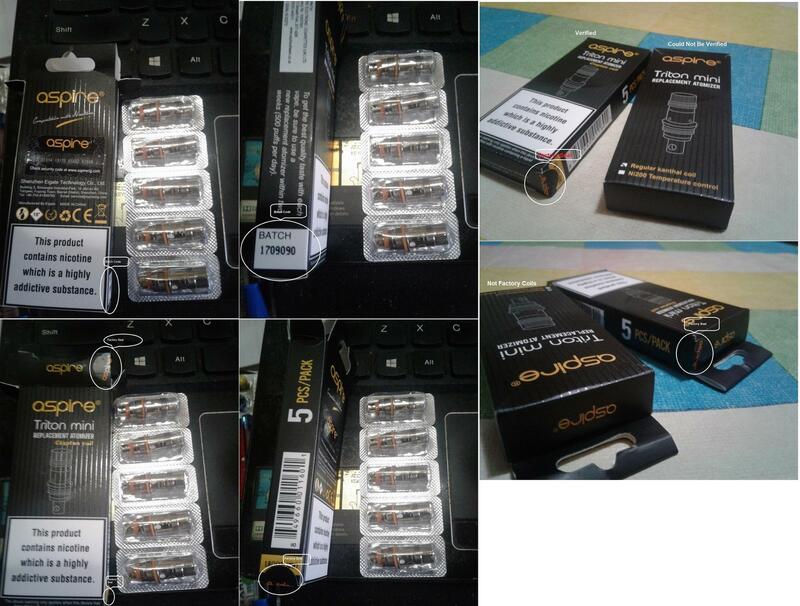 I purchased some Triton Mini 1.2 Ohm coils on AliExpress from Skeycig Store (Store No.1379475 Guangdong China). The box did not have the Aspire tamper seals on it. When I tried to scratch off the security code it ended up going through to paper. You can only read the last 9 digits of the code. On my other Aspire coils, tank, I have not had a problem with scratching off the scratch code. Also they all either have a Batch Code or a Serial Number. These coils have neither. The seller say it is the old style box, before the new TPD box. But TPD boxes still have a serial number. I was also wondering, I thought Triton Mini coils are only about a year old, did they ever come in the old box? I contacted Aspire about the problem with the scratch code, but they said they could not verify anything without the Batch Code/Serial Number. In a dispute on AliExpress my claim was rejected because the seller provided proof that Aspire provided the coils. I have not seen the proof. 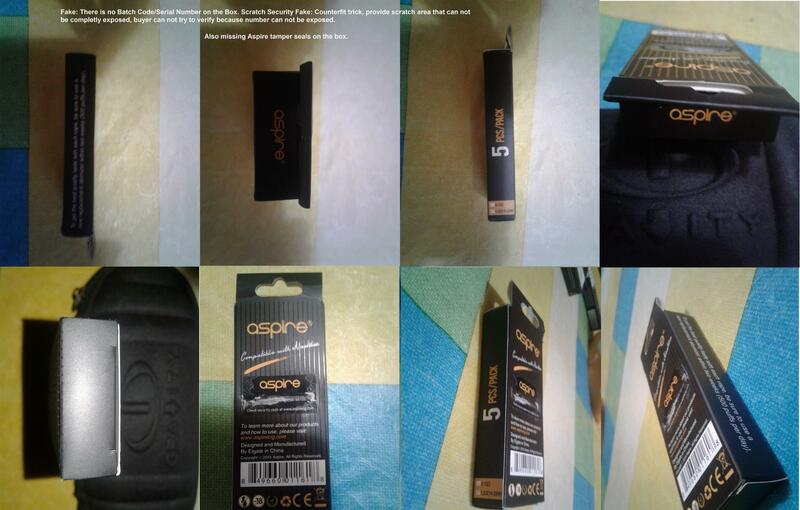 I am asking to see the proof so I can again present the pictures of the box with no Batch Code and coils along with the proof to see if Aspire can confirm they did sell the store coils with no Batch Code and what the problem is with the Security Code. Trying to upload pics of the box but it does not seem to be working. I did submit an email I got from aspire, but it seems not to be clear enough about the Batch Code. The next time I suggest you buy from a reputable retailer. Not Aliexpress or eBay! "Since the seller has provided the authorization file from the brand owner to proved the item was original, we would like you to provide counter evidences as proof guide. " The pictures are not enough and apparently Aspire is backing the sellers side. I have tried to get a solid opinion from Aspire, so far not one solid enough, I even think what they said is too vague. A lot of AliExpress Sellers do provide good products. There are some sellers that are problems, but opening a dispute has always solved the problem in the past. For Kanger coils the sellers have been 100%, Functioning Security Codes, Batch Codes and tamper seals on all boxes. The .5 Kangers just seem to last and last. Some of the Nautili's, ones in sealed boxes with "17" Batch Codes I have tossed in less than 3 days. I was going to try the Triton Mini's to see if they were any better. It appears that this seller is an approved seller, listed right here on Aspires site. SKey is listed as approved and it seems the distributer and the store on AliExpress are related. I have no idea what these coils I was sent are or what it means. After reading comments from others on this site it appears Aspire does not care. From my experience with this I am left wondering if this is a way for Aspire to dump there even worse than normal rejects. Just guessing. But no seals, no tamper seals, faulty scratch security verification. What good is any reputable dealer when the product comes from a company that lacks integrity? Yeah, there are bad sellers on Ali. If you dispute Ali does try to fix it. It is stressful though. But this is a tricky one. It looks like Aspire is using Ali as a dumping ground while playing the plausible deniability game. Yep, this is going to hurt my trust on Ali even more. It will slow down what I buy. I am already no tank from SXK from any company any where (really wanted to try V5, but it became obvious buyer beware before I ever did attempt, so I didn't), no batteries except from PVA (I do not have access to the other reputable companies). But I will not completely stop buying from them. But I guess I need to cut my losses and not buy anything from Aspire. Two packs of coils cost more than a Berserker? The SS I put in it is a month old and still taste good. And they cost only pennies to build. It's more than money (I just ordered batteries from PVA), trust comes slow, breaks easy, almost impossible to get back. Based on an email I have received from Aspire the seller is genuine. Aspire has no concern in regards to their product having a failing security code, no batch code and no tamper seals. They are all meaningless. 1.ADD a warning sentence "This product...."